A delicious healthy meal that provides an excellent balance of high quality protein from milk and soy, essential micronutrients and added botanicals and herbs. The number 1 meal-replacement shake in the world. Formula 1 shakes have helped people all across the globe reach their weight-loss goals. Rich in protein from dairy and soy (18g per serving), Formula 1 shakes are a great option if you are looking to build lean muscle mass along with exercise. 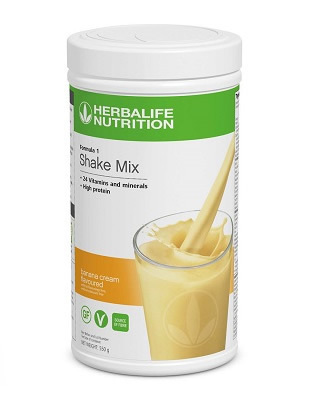 Quick to whip up, an F1 shake is a convenient healthy alternative to a high-calorie breakfast, lunch or dinner. Available in six delicious flavours and also available: F1 Free From – free from lactose, soy and gluten when made according to instructions and suitable for vegetarians.